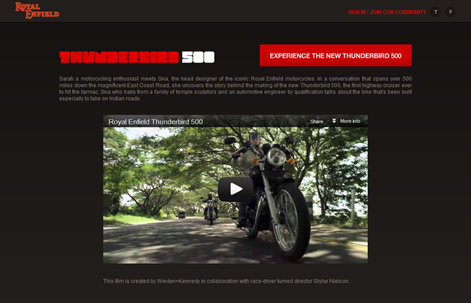 The 'ultimate highway cruiser', Royal Enfield’s Thunderbird 500 arrived last week. A stylish, sharp bike deserves an amazing web presence, and it gets one. Experience Thunderbird is a fantastic site where mundane (but key) elements of a typical auto website (read product specifications & features) are given a spin. The pre-loader is a numeral in the Thunderbird font. The hero owns the centrepiece of the site and the bottom strip of the page gives users a peek into various stand-out features of the bike. You could click on these to load a high resolution image that can be viewed at various angles, or turn on keyboard mapping to hit an alphabet key and see the corresponding feature. The media zone covers launch news bytes and what fans are saying on Twitter. Even the way the Dealer Locator is laid out is different. The landing page showcases a video created by Wieden+Kennedy for the brand. What works here is both the concept and the execution which is a hard to find combination. Visuals and design are simple, striking and unique.